Research follows money. Where there is funding, researchers flourish and new information is discovered and disseminated. Funding many times is related to solve problems. Brain research is no different. Most brain research deals with abnormalities in brain functioning—dementia, Parkinson’s disease, post-traumatic stress syndrome, attention deficient disorder, and dyslexia to name a few. However, little has been done to explore the workings of a normal brain at work. One area where this is less true is neuroscience and reading. Scientists are trying to uncover the secrets of the brain and language; language is what differentiates humans from other animals. Thus, a body of work has been created around the issue of reading. Hruby and Goswami (2011) review a wide variety of research from the neuroscience field, specifically for researchers in reading education. Researchers are using imaging studies to find what parts of the brain are involved in reading, while others are studying neural activity to establish a detailed seconds-long timeline of what happens during the reading process. During decoding, brain areas related to hearing, vision, spatial processing and speaking are activated. 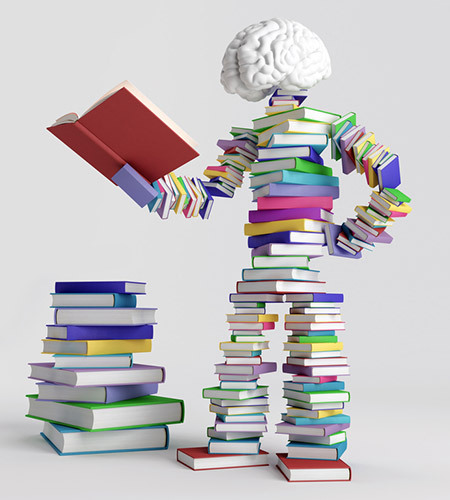 In general, many of the reading functions take place on the left side of the brain. However, children younger than nine years of age use more of the right side of their brain than older children and adults. It is supposed that normal development accounts for this difference. Located on the left side of the brain is an area called the Visual Word Form Area (VWFA). When adults are shown printed words, this area shows activity. In children, more activity is seen in this area as they become better readers. Although this area is responsive to any sequence of printed letters, more activity occurs when the string is an actual word. The brain can distinguish a real word from a nonsense word in less than 1/5 of a second (the average is 170 milliseconds). In addition to the VWFA, other parts of the brain are dealing with the auditory functions of decoding (left occipitotemporal regions) and the combining of the auditory and visual functions (temporoparietal junction/TPJ). When reading, children’s brains activate three core areas in sequence. In early reading instruction, it is assumed that students first pass through a stage where they identify whole words and their meaning (I equate this to sight words). If this is true, all three core areas are not needed to go from print to meaning. However, in one study, the children consistently used all three areas. With further study and replication, this finding may have implications for the way we teach early literacy. Moving away from decoding, Hruby and Goswami (2011) move to comprehension, beginning with vocabulary learning. The most prominent study compared learning vocabulary in one of three ways: spelling and meaning; spelling and pronunciation; pronunciation and meaning. Later, they were asked to recognize the new words in other contexts. Brain activation was strongest for the words that had been learned by spelling and meaning. This could be important for vocabulary learning because the stronger the recognition, the more easily we can recognize it and begin to add related information. Along with individual words, language comprehension deals with semantics and syntax. Semantics is the relation of words to each other; syntax is the grammar that creates well-formed sentences. Research has shown that these three parts of reading comprehension happen in different parts of the brain and in sequence. First, the brain activates to understand individual words, then the semantics, and last the syntax. The areas of the brain that handle semantic and syntactic processing develop uniquely in each person, depending on their differing experiences. Very little neuroscientific research has been done on a reader’s prior knowledge and how that effects his brain processing as he reads. This article is well-organized, clearly laying out at the beginning what will be covered, and ordering the studies in a linear pattern that is easy to follow. Major studies that apply specifically to reading research and instruction were chosen, and they were interesting to learn about. The authors are brave souls, attempting to bridge a very wide chasm between neuroscience, with its inherent mystery and intimidating vocabulary, with researchers in the reading field. This is a daunting task, and they have approached their topic with integrity. While trying not to diminish the work of the scientists, I think they have left the material too difficult for readers from other fields to understand. Granted, I have not read much on this topic, but I had to read most of the study summaries multiple times, parsing each sentence in order to get a basic understanding. The material is still inaccessible to many who need to know what is happening in neuroscience that effects education. Hruby and Goswami (2011) conclude with thoughts concerning the role of neuroscience research and reading research, with which I strongly concur and which reflects conversations in my doctoral classes at Arizona State University. Neuroscience is an exciting new area of research, which can enlighten classroom practices. But, it is not the only truth to be considered. Reading research, whether based on traditional psychology, behaviorialism, or simply what works in the classroom, are equally important. Each is a lens with which to see a portion of the truth. Truth is found in the intersection and compilation of all these practices and viewpoints. Rock, D., & Sctiwartz, J. (2007). The Neuroscience of Leadership, 10–17. Concentrating on three main parts of the brain: the prefrontal cortex, the basal ganglia, and the amygdala, Rock and Schwartz (2007) explain some of the functioning of the brain and implications for leaders of change. The prefrontal cortex is where working memory resides and where new information is processed. The basal ganglia is used in routine activities that we know how to do well without a lot of conscious thought and links simple behaviors from different parts of the brain. If someone wants to change a routine or process that is already well-known, he has to concentrate on that change until it is embedded in his memory. This means he has to override what is stored in his basal ganglia, a low-energy part of the brain, by using his prefrontal cortex, a high-energy part of the brain. This expenditure of energy and effort causes an actual physical sensation of discomfort. The brain also has the ability to detect “errors” or patterns that are different from what is expected. The unexpected input causes the brain to give “strong signals that use a lot of energy, showing up in imaging technology as dramatic bursts of light” (Rock & Schwartz, 2007, p. 12). These bursts of energy alert the amygdala, which is where the primal emotions of fear and anger are located. They also take energy away from the prefrontal cortex. So, when something is different from what we expect, we reduce the energy used for logical thought and increase the energy used for fear or anger. The implications are that change is truly physically painful as high-energy areas of the brain are at work. Change arouses the basic feelings of anger and fear, which can inhibit learning. Focusing on new behaviors is powerful and can actually change the pathways in the brain, especially if the focus is repeated until the change has moved from the prefrontal cortex (working memory) to the basal ganglia (long-term, automatic memory). This is a well-organized article that takes a dense subject and makes it understandable. With the projected audience of business leaders, the authors probably assumed that the readers do not know much, if anything, about brain functioning and research. The practical, clear advice delineated in each section is supported with brief technical explanations of the workings of the brain. Everyday examples help exemplify the technical points. Dr. Jeffrey Schwartz, M.D. and Dr. David Rock, are unique because they come from different fields, yet their collaboration is essential for applying the findings of brain research to other fields. Dr. Schwartz is a psychiatrist who has done research on brain functioning, concentrating mostly on brain imaging and obsessive-compulsive disorder, and Dr. Rock is an international business professor who has written articles and speaks widely about the implications of brain research in business. The main drawback of this article is that the studies that contributed to this body of knowledge are not identified with in-text citations nor with an end-of-paper bibliography. Schwartz & Rock are respected in their fields and are reliable sources of information. The researchers for various studies are noted in the text, but direct reference to a particular journal is not included. Perhaps Schwartz & Rock did this by design so that the article would be more accessible to the general public and to business professionals who are not academics. I think this article informs some of the work of Dr. Michelle Jordan. In our class discussion with Dr. Jordan (2014), she pointed out that uncertainty can be productive and is essential for learning. However, in a study of uncertainty in a robotics task in fifth grade collaborative groups, one student, Roy, had difficulties with interpersonal skills as part of his group seemed to ignore or chasten him. Jordan and McDaniel (2010) comment, “So salient was Roy’s need to resolve his relational uncertainty that he seemed unable to attend to the robotics task” (p. 24). Roy’s brain was reacting to an “error” where what was happening in his group (they were ignoring him) and what he expected were different. His brain is now using a large amount of energy to relay error messages and to activate the amygdala, the home of primal fear and anger. This use of energy reduces the ability of the prefrontal cortex to process the higher-order thinking necessary to attend to the engineering problem. This article focuses on the implications for business management and change. However, the field of education can also benefit from this type of study. It was a good place to see how neuroscience can inform practices in another field. Many of the ideas are directly applicable to an educational setting. Also, I would like to go back and delve in to some of the actual scientific studies mentioned. The field of neuroscience is still new. Much of the research is recent and more implications may be found as the research advances. Jordan, M. E., & Mcdaniel, R. R. (2010). Managing Uncertainty During Collaborative Problem Solving in Elementary School Teams : The Role of Peer Influence in Robotics Engineering Activity, 00(2002).